Chef Ernst van Zyl and Partner Liz among with their team are excited to welcome you all to The Glazebury. We are a pub and restaurant serving only the best seasonal offering with an array of beers and wines. Having purchased the Chat Moss Hotel from Marston's Brewery earlier this year, the new owners set about completely refurbishing the site from top to bottom. 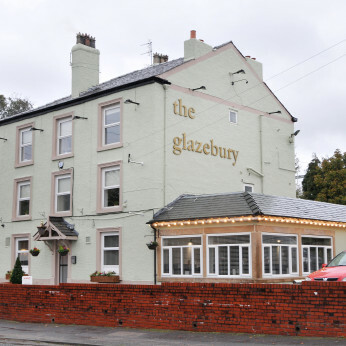 The new start prompted a new name and ‘The Glazebury’ was chosen. Our aim is to give the local community a pub to be proud of as well as attracting visitors from far and wide to sample our menu and selection of quality Beers, Wines & Spirits. We are situated just off the East Lancs (A580) about 500 yards past Bents Garden Centre on the left hand side. Tasting menu for 3/4/5/6 April. 👀 A sneaky peek at our tasting menu for 3/4/5/6 April. The above dates are for our soft launch and we are offering 50% off the tasting menu! We currently have 2 tables of 2 left for Friday. Saturday is FULL and Wednesday / Thursday are already looking busy. There will be an outside bar and food hut and we are now taking bookings for the restaurant. For bookings please call 01925 382056. Join us for St George’s Day on the 23rd April at The Glazebury. Arrival 7pm for a glass of Nyetimber classic Cuvee seated at 7:30 for a three course meal celebrating the best of English produce. 3 courses celebrating English produce.